CALGARY, ALBERTA--(Marketwired - Jan. 14, 2014) - Delphi Energy Corp. (TSX:DEE) ("Delphi" or the "Company") provides the following operations update on its Montney capital program. Delphi is pleased to announce completion and clean-up test results on its initial exploration well at 11-17-59-22 W5M ("11-17") on the South Bigstone Montney farm-in lands, part of the Company's contiguous 122 section land position in the Bigstone area. The 11-17 Montney horizontal well is located approximately 13 kilometres south of the Company's ongoing drilling activity at East Bigstone. The well was drilled as a whipstock operation from the Duvernay stratigraphic drill with a horizontal lateral length in the Montney of 1,848 metres (most similar to the initial East Bigstone slickwater evaluation well at 15-10-60-23 W5M ("15-10") with a horizontal lateral length of 1,424 metres). After successfully placing all 26 stages of the fracture stimulation, the well flowed on clean-up over an eight day period, recovering approximately 34 percent of the initial frac load water. During the last 24 hours of clean-up flow, the well averaged 4.4 million cubic feet per day ("mmcf/d") of raw natural gas and 165 barrels per day ("bbls/d") of field condensate (42 bbls/mmcf of sales gas). With estimated natural gas liquids ("NGL") plant recoveries of 35 bbls/mmcf of sales gas, total production over this time period was 962 barrels of oil equivalent per day ("boe/d"). For comparison purposes, Delphi's 15-10 well produced at an average rate of 957 boe/d, consisting of 4.6 mmcf/d of raw natural gas, approximately 118 bbls/d of wellhead condensate (47 bbls/mmcf of sales gas) and an estimated 151 bbls/d of gas plant recovered NGLs over the final 24 continuous hours of its seven day clean-up test. Total production at 15-10 over the first 30 days was approximately 991 boe/d. The 11-17 well is expected to be pipeline connected and on production in the third quarter of 2014 and consistent with the Company's other slickwater fracture stimulated wells, will continue to recover load water over the next several months of production. The test results at 11-17 validate the reservoir rock quality and liquids-rich nature of the production mix as being consistent with East Bigstone, 13 kilometres to the north. Based on this test result, Delphi expects to begin development of the Montney play in South Bigstone in the latter part of 2014, employing the same 2,500 to 3,000 metre horizontal well lengths and 30 stage fracs as employed in the ongoing Montney development program at East Bigstone. At East Bigstone, Delphi has now drilled a total of ten horizontal Montney wells of which nine are extended-reach horizontal laterals with lengths up to 3,000 metres. Since changing completion techniques from conventional oil fracs on the first three wells to a slickwater hybrid fracturing technique, the Montney wells at East Bigstone have exceeded the Company's expectations. The previously announced 15- 30-60-22 W5M ("15-30") well, the most recent to be placed on production, with a horizontal length of 3,014 metres, has produced at a Company record high rate of 2,076 boe/d over the first 30 days of production. During this initial 30 day period, the 15-30 well produced at an average rate of 8.3 mmcf/d of raw gas, 566 bbls/d of wellhead condensate (76 bbls/mmcf of sales gas) and an estimated 272 bbls/d of shallow cut plant NGL production. For comparison purposes, Delphi's Montney producer at 10-27-60-23 W5M ("10-27") located five kilometres to the west of 15-30, produced at an average rate of 1,815 boe/d over the first 30 days of production, consisting of 6.8 mmcf/d of raw gas, 582 bbls/d of wellhead condensate and shallow cut plant NGL production of 222 bbls/d. The 10-27 well has produced 319,000 boe (120,000 barrels of total NGL, 65 percent of which is field condensate) since coming on production in March 2013. 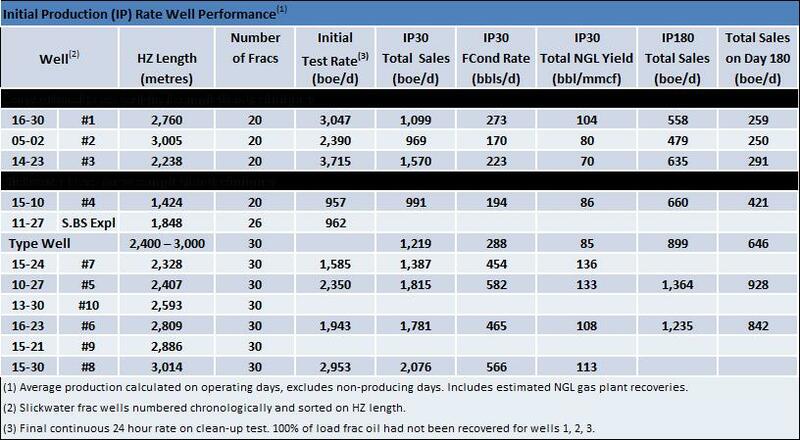 The table below illustrates the significant impact the slickwater hybrid fracturing technique has had on well performance at Bigstone in comparison to smaller conventional frac methods. Well performance during the initial 30 days of production has almost doubled, as observed in the 15-30 and 16-30 production performance where the two wells are approximately 400 metres (one spacing unit) apart. Longer term production performance has tripled when observing production rates after 180 days. Wellhead condensate production and yields have also improved by two to three times. The Company continues optimizing capital efficiencies through its extended-reach drilling plan targeting horizontal lateral lengths between 2,500 and 3,000 metres. In the table above, the East Bigstone wells are sorted on horizontal lateral lengths illustrating that lateral length is an important driver in enhancing well production performance. 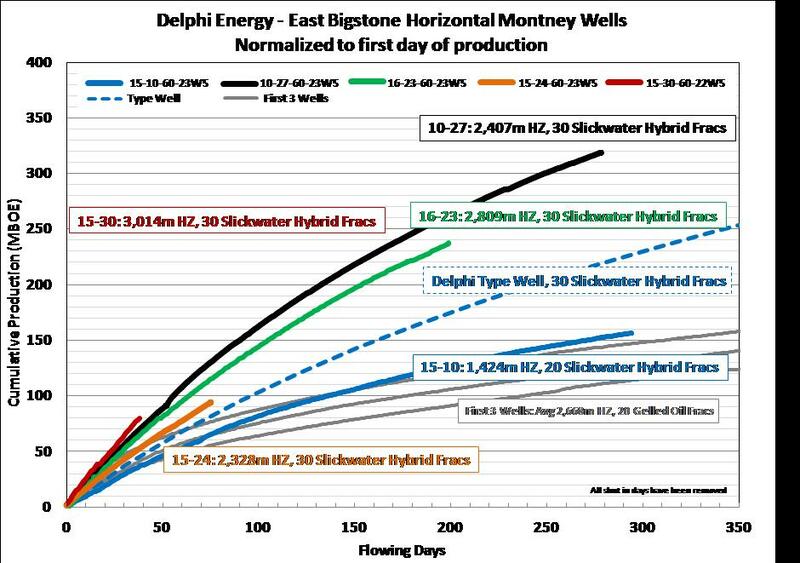 The adjacent cumulative production plot illustrates the step change in well performance experienced with extended-reach horizontal lateral sections stimulated with the slickwater hybrid fracturing technique as compared to conventional gelled oil fracs. The wells continue to exceed the Company's initial type curve expectations (illustrated by the blue dashed line). Given the exceptional well performance to date, Delphi plans to re-evaluate its base type curve assumptions after the winter drilling program. Drilling operations continue in East Bigstone with two additional wells now drilled and one to two more wells planned prior to break-up in 2014. The 15-21-60-23 W5M ("15-21") Montney well has been drilled to a total depth of 5,875 metres with a horizontal lateral length of 2,886 metres and is in the process of being stimulated with a 30 stage slickwater hybrid completion. The 13- 30-60-22 W5M ("13-30") Montney well has recently reached its planned total depth of 5,419 metres in a Company record 27 days, with a horizontal lateral length of 2,593 metres. The 13-30 well is scheduled to be completed in the first two weeks of February. To handle the rapidly growing Montney production volumes, the Company is continuing with construction to expand its 7-11 facility to handle 45 mmcf/d of raw gas as well as increased field condensate volumes with the installation of larger inlet separation and increased condensate storage tank capacity. As previously announced late in 2013, Delphi has entered into a Gross Overriding Royalty ("GOR") agreement to partially fund the drilling of ten Montney wells in East Bigstone over the next 12 to 18 months. The parties purchasing the GOR ("Royalty Owners") will contribute $25.0 million over this time frame towards seven wells scheduled to be drilled in 2014 ($17.5 million) and have an option on the first three wells of 2015. The Royalty Owners will be granted a GOR on the Company's working interest revenue on the wells until an agreed upon rate of return is achieved, at which time the GOR will be extinguished on all wells. Also as previously announced, Delphi's lenders (National Bank of Canada, Bank of Nova Scotia and Alberta Treasury Branches) completed their semi-annual review of the Company's credit facilities, renewing the existing $140.0 million revolving credit facility. The facility is a 364 day committed facility available on a revolving basis until May 26, 2014 at which time it may be extended at the lenders' option upon completion of the annual review to determine the borrowing base. The annual review will be based upon the Company's December 31, 2013 reserve report, the results of the winter drilling program and the lenders' view of commodity prices. The GOR funding, expected funds from operations for 2014 and reconfirmation of the Company's credit facility provide the financial resources for the Company to carry out its planned 2014 capital program. Delphi reiterates its market guidance for 2014 but expects to review it as additional results of the winter drilling program are evaluated. Corporate production is forecast to grow 20 percent compared to 2013, predominantly from a Montney focused capital program with its superior netbacks, resulting in expected cash flow growth of 49 percent. Delphi is estimating production to average 9,500 to 10,000 boe/d on a net capital program of $67 to $72 million, drilling a total of seven Montney horizontal wells at Bigstone. Total debt at year end 2014 is expected to be between $145.0 and $150.0 million versus between $135.0 and $140.0 million at the end of 2013. The total debt to funds flow ratio is forecast to drop to 2.2 times in the fourth quarter of 2014 and reach a targeted 1.5 times in 2015. Delphi expects AECO natural gas prices to average approximately Cdn. $3.35 per mcf and Edmonton light oil prices to average approximately Cdn. $93.50 per barrel resulting in cash flow for 2014 of approximately $55.0 to $60.0 million. Currently, the Company has approximately 60 percent of its natural gas production hedged at an average price of $3.63 per mcf for 2014 and approximately 27 percent of its crude oil and condensate production hedged at a floor price of Cdn $96.03 per barrel for the first half of 2014. Delphi's business plan contemplates production growth to 20,000 boe/d by 2017, with targeted annual production per share growth of 25 percent and annual cash flow per share growth of 45 percent. Capital spending over the five years to achieve that result under the plan is projected to be $560 million, funded 90 percent from cash flow to drill 50 Montney horizontal wells and fund the expansion of Delphi's 100 percent owned facility. The contemplated 50 well drilling program represents less than half of the current development drilling inventory on approximately 50 percent of Delphi's current Montney undeveloped land holdings. The Company now has a current project inventory that will provide economic growth beyond a 10-year horizon. Over this time period, the Company's balance sheet is forecast to continually strengthen, with internally generated cash flow funding the majority of the capital expenditures on a go forward basis. More particularly and without limitation, this management discussion and analysis contains forward looking statements and information relating to the Company's risk management program, petroleum and natural gas production, future funds from operations, capital programs, commodity prices, costs and debt levels. The forward-looking statements and information are based on certain key expectations and assumptions made by Delphi, including expectations and assumptions relating to prevailing commodity prices and exchange rates, applicable royalty rates and tax laws, future well production rates, the performance of existing wells, the success of drilling new wells, the capital availability to undertake planned activities and the availability and cost of labour and services. Although the Company believes that the expectations reflected in such forward-looking statements and information are reasonable, it can give no assurance that such expectations will prove to be correct. Since forward-looking statements and information address future events and conditions, by their very nature they involve inherent risks and uncertainties. Actual results may differ materially from those currently anticipated due to a number of factors and risks. These include, but are not limited to, the risks associated with the oil and gas industry in general such as operational risks in development, exploration and production, delays or changes in plans with respect to exploration or development projects or capital expenditures, the uncertainty of estimates and projections relating to production rates, costs and expenses, commodity price and exchange rate fluctuations, marketing and transportation, environmental risks, competition, the ability to access sufficient capital from internal and external sources and changes in tax, royalty and environmental legislation. Additional information on these and other factors that could affect the Company's operations or financial results are included in reports on file with the applicable securities regulatory authorities and may be accessed through the SEDAR website (www.sedar.com). The forward-looking statements and information contained in this press release are made as of the date hereof for the purpose of providing the readers with the Company's expectations for the coming year. The forward-looking statements and information may not be appropriate for other purposes. Delphi undertakes no obligation to update publicly or revise any forward-looking statements or information, whether as a result of new information, future events or otherwise, unless so required by applicable securities laws. Non-IFRS Measures. The release contains the terms "funds from operations", "funds from operations per share", "net debt", "operating netbacks" "cash netbacks" and "netbacks" which are not recognized measures under IFRS. The Company uses these measures to help evaluate its performance. Management considers netbacks an important measure as it demonstrates its profitability relative to current commodity prices. Management uses funds from operations to analyze performance and considers it a key measure as it demonstrates the Company's ability to generate the cash necessary to fund future capital investments and to repay debt. Funds from operations is a non-IFRS measure and has been defined by the Company as cash flow from operating activities before accretion on long-term debt, decommissioning expenditures and changes in non-cash working capital. The Company also presents funds from operations per share whereby amounts per share are calculated using weighted average shares outstanding consistent with the calculation of earnings per share. Delphi's determination of funds from operations may not be comparable to that reported by other companies nor should it be viewed as an alternative to cash flow from operating activities, net earnings or other measures of financial performance calculated in accordance with IFRS. The Company has defined net debt as the sum of long term debt plus/minus working capital excluding the current portion of the fair value of financial instruments plus the long term portion of the restricted share units ("RSU"). Net debt is used by management to monitor remaining availability under its credit facilities. Operating netbacks have been defined as revenue less royalties, transportation and operating costs. Cash netbacks have been defined as operating netbacks less interest and general and administrative costs. Netbacks are generally discussed and presented on a per boe basis.